Media in today's world has Information, Infotainment, Entertainment, Advertising, Marketing, Public Relations, and everything that matters for employment, innovation. and culture. Every aspect of these facets shouts screams of media plurality. The evolution of the power of media has been extremely impressive, wherein media have acquired the power to make or break public opinion and further extended to form the culture in every aspect of people's life. The Indian entertainment and media (M&E) sector is expected to grow at a CAGR of 10.3 percent over the next four years to cross $40 billion by 2020, predicts PwC's latest report - Global Entertainment and Media Outlook 2016-20. Emergence of Digital Media and Internet penetration has left the population spellbound by its affects on their culture. From a traditional media to now an app based media, this industry has evolved in leaps and bounds with every new innovation. As a result, it poses a threat to their relevance on the mass and demands fresh and talented professionals to bring in strategies and effective actions to revive them. However, the dearth of trained and quality professionals remains a generic issue of all time, clearly suggesting that there should be more number of skilled professionals to deal with the ever-evolving changes in the Media Industry. 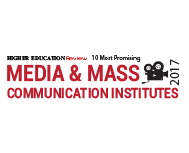 Screening a number of institutes offering Media Studies in the country, we at the Higher Education Review's first issue of 2017 have brought you '10 Most Promising Media and Mass Communication Institutes.' These media institutes represent themselves through their performance-oriented curriculum, teaching methodology, infrastructure and most importantly through industry collaborations and practical exposures during the training period. Students who have keen interest to pursue a profession in media will find these selected institutes helpful, as it would guide their decision making while choosing their founding destination to begin with their career graph.